Stir mustard with a small quantity of the water, or the wine vinegar. Rub it with the back of a spoon until it dissolves. Mix all other ingredients in a jar, stir well and cover with a lid. Keep the dressing fresh in fridge. Stir well all ingredients in a jar and cover with a lid. Use this Scarsdale Salad Dressing on any mixed green salad. Keep the dressing fresh in fridge. 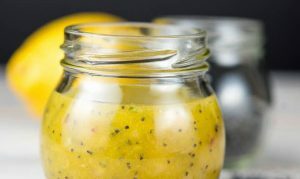 Stir mustard with a small quantity of the lemon juice. Rub it with the back of a spoon until it dissolves. Mix all other ingredients in a jar, stir well and cover with a lid. Keep the dressing fresh in fridge. Add all ingredients to a small jar in that order. Cover it with a lid. Shake it well. Keep the dressing fresh in fridge. Mix in a small jar. Cover it with a lid. Keep it fresh in fridge and use on any type of vegetables salads, including green ones.